The approaching sunny summer time is inviting to spend more time outside – a healthy mindset but causing some headache when it comes to keep all our electronic gadgets charged up while disconnected from the power grid. Solar bags started to show up as commercial products just a few years ago but have become a popular option to keep the growing collection of gadgets-on-the-go powered. What’s more, companies start to add other features to these type of bags, features that have been hardly possible without solar panel integration. One of the new generation of solar power backpacks is the Multi-Purpose Solar Charger Backpack from Brando with integrated Ultrasonic mosquito repellent, making it the ultimate backpack for outdoor enthusiasts. The storage capacity of the power bank at 10.000mAh is impressive and offers output options of 19v, 13~16.8v, 13v & 9v @3.5A and 5V@1A. This is enough power to serve for almost any portable device you might possess. There is no indication of a solar charging time but judging on the storage battery capacity it might take several days of full sunshine to get this battery fully loaded. If you can’t find enough sunny hours, there is the option to load up your bag via AC. The Multi-Purpose Solar Charger Backpack is retailing for $189.- including a ton of adaptors and connectors for many types of personal devices and laptops. 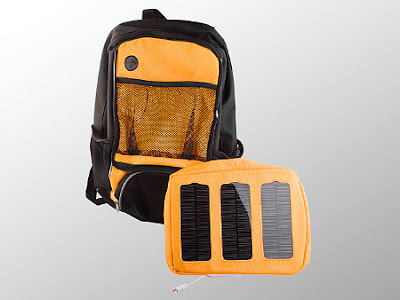 A nice option is the modular solar panel part which can be taken off the backpack and placed as personal solar power generator on a sunny place outside or behind a window while driving around, being at the office or at home. 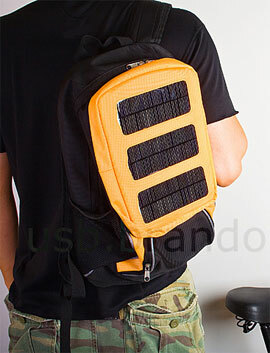 If you dream about being outside while doing your work on the computer the ‘Multi-Purpose Solar Charger Backpack’ allows you to transfer your office work into the great outdoors, making you independent from the power grid and chase away the bugs.